These days, you don’t need to go to an expensive masseuse to enjoy a professional foot massage. Robots have invaded the massage industry. Mechanical foot massagers are quite effective. They never complain. They never get tired. And they never expect to be tipped. If you haven’t tried out a modern massage machine before, you should give one a whirl. The quality of the massage you’ll experience might surprise you. Medical massage machines are designed to help people recover from injuries and chronic foot problems like plantar fasciitis. Shiatsu massagers replicate a special kind of Japanese foot massage style called shiatsu. A shiatsu massage is an intense type of massage that targets pressure points found on the foot. Kneading foot massage machines emulate the circular motion a massage therapist makes when he digs into the fleshy part of your foot with the tips of his fingers. Foot bath massagers wash your feet while blasting them with water jets and/or stimulating them with bubbles. machines automate many types of foot massage services you’d expect to enjoy when you visit a spa. They often come with useful attachments that make it easier to give yourself a pedicure. If you’ve never had a foot massage before, you’re missing out on an amazing experience. Foot massages don’t only feel wonderful– they’re also great for your health. It’s easy to forget that every part of your body is connected. Martial experts know how to exploit the human body’s interconnected nature. Kyusho-jitsu experts know how to bring their opponents to their knees by attacking key pressure points. The automatic reaction your body makes in response to pressure point stimulus is called a reflex. The nerves that connect to different parts of your foot lead all the way up to your brain. Along the way, your nerves pass through various important internal organs. Reflexologists believe that stimulating various pressure points found on the feet, hands and ears can be used to treat a variety of different illnesses. Reflexology sessions can be effective, but they’re also expensive. If you want to learn how to stimulate your pressure points yourself, investing in a quality foot massage machine is a good idea. A recent study from Denmark proved that foot massages dramatically reduce headache symptoms. 65% percent of the headache sufferers in the study were able to stop taking medication after starting an intensive foot massage program. Spanish medical researcher Dr. Jesus Manzanares found that therapeutic foot massages were very effective at treating hypertension. Fifty percent of the subjects in one study were able reduce their blood pressure medication by half. Surprisingly, targeted foot massage therapy can even help chemotherapy patients feel less nauseous according to research published by the peer-reviewed scientific journal Cancer Nursing. 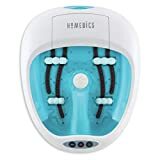 Are you looking for a foot massage spa that will clean your feet while also massaging them with powerful blasts of water or are you looking to buy a foot massager that’ll help you recover from special medical problem? No matter what type of foot massager you’re looking for, our “best of” list will help you find the right product. Be sure to read the whole thing so that you know what your options are before you make a buying decision. Shiatsu massages can do wonders for tired feet. During a shiatsu massage, a massage therapist goes after the pressure points on your feet with his or her thumbs and knuckles. The only problem with traditional shiatsu massages is that they are quite expensive. If you want the same experience but don’t want to hire a human to do the work, check out this machine from uComfy. The uComfy massager doesn’t have real thumbs and knuckles, but its massage knobs do a great job of simulating an actual shiatsu massage. Many different massage settings. This massager isn’t just a cheap vibrating toy. It kneads and warms your feet– and even uses air pressure to help your relax. It’s quiet. Some foot massagers are very loud, but this one purrs like a cat. You can use it without disturbing your family. Easy to clean. When it’s time to clean this machine, all you have to do is remove the interior cloth surface that protects your feet from coming into contact with the machinery. The coverings are easy to wash– all you have to do is throw them in the laundry with your other clothes. Your feet will never get sweaty. This massager blasts your feet with fresh air as it grips and kneads them so that you don’t perspire. The uComfy’s internal heater isn’t very powerful. 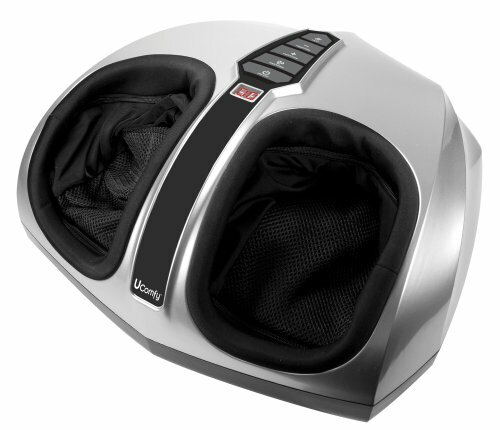 As far as shiatsu style foot massagers go, the uComfy Shiatsu Massager is one of the best options out there. Many shiatsu massagers make a lot of noise, but they don’t do much to your feet. This powerful massager will grip, press and knead your feet exactly as hard as you want it to. Heat can work wonders on tired feet. Warmth prevents painful muscle spasms, improves circulation, helps the body purge toxins and speeds up the healing process. But not all massage machines come with good built-in heaters. The uComfy Shiatsu Massager listed above has an okay heater, but the problem is that it isn’t very strong. 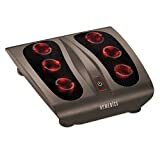 The Shiatsu Foot Massager by Brookstone features a very powerful internal heater that’ll keep your feet nice and warm during your massage. If you want to enjoy warm feet while your foot massager does its thing, this might be the perfect massager for you. It comes with a powerful internal heater. There are several different heat settings that allow you to find just the right level of warmth for your feet. 3 selectable massage modes. This massager can soothe, pulse or energize your feet. Just twist the knob to change the mode to whichever one you’re in the mood for. Uses air compression to keep your feet dry. The compressed air feels good on your skin and prevents your toes from getting sweaty while they are inside the machine. Adjustable intensity. On “intense” mode, this machine really digs into your feet. If you don’t like so much pressure, you can easily dial it down a notch or two. Several people who bought this machine complained that some of its settings are uncomfortable. If you crank this foot massager up to the high intensity setting, it might pinch your pinky toe. Many foot massagers feature a built-in heater, but not all of them are very powerful. The heater inside this massager from Brookstone will definitely keep your feet feeling cozy when it’s cold outside. If heat is your priority, give this machine a hard look. You’ll have to pay a little extra because of the Brookstone brand name, but you’ll be happy that you invested the next time you want to experience a nice, warm foot massage. Kneading is a special kind of circular massage technique designed to compress your body’s soft tissues. Masseuses use their fingers to roll your muscles and skin gently against your bones. Modern massage machines are excellent at kneading. Plus, they never get tired or expect to be tipped. If kneading foot massages are your favorite, check out the FMS-270H by Homedics. Our favorite thing about this massager is the way it’s built to deliver a professional quality kneading experience. We also liked that there are many ways to tweak its settings. More massage points than most other foot massage machines. This device has 6 rotational heads and can massage your feet in 18 different places. You can control it with your toes. You don’t have to reach down and use your fingers to turn the machine on and off. Its buttons are made specifically for toes. Perfect for the office. Its low profile, conservative color scheme and quiet operation make it great for use in office environments. It’s strong. Like the other massage machines on this list, this machine really grips and squeezes your feet when you turn the dial all the way up. Because this machine doesn’t cover your whole foot, the heating feature doesn’t work so well. If kneading is your thing when it comes to foot massages, you’ll probably enjoy this foot massager. It has more massage rollers than most other foot massage devices. It’s also great for the office because you don’t have to take off your socks to use it. The only downside is that it only massages the bottom part of your feet. If you are looking for a machine that will massage every part of your feet, you’d be better off with one of the other products on our list. But if all you want is a basic foot massager, this one will suit your needs quite well. All-in-one foot spa machines aim to replicate the type of services that are typically offered at spas. 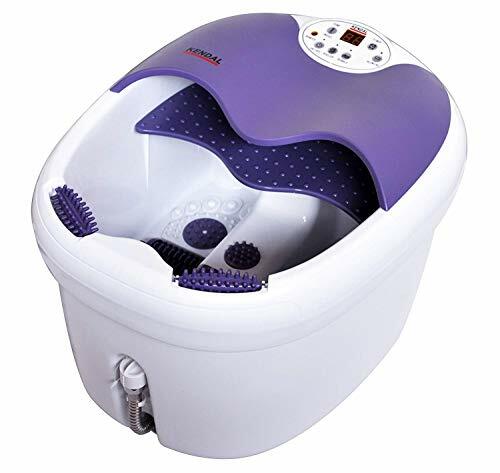 Most machines of this type use heated water to relax, clean and massage your feet. All-in-one foot spa machines require access to water. Also, they are noisier than most other foot massage machines. The Good thing about these types of foot massagers is that they clean your feet as they massage them with bubbles and soothing blasts of pressurized water. If you want to try out an all-in-one foot spa machine, you won’t go wrong with the FBD-1023. It’s easy to use, reasonably priced and is packed full of useful features. Built-in heater keeps your water warm. This massager features a built-in heater that’s powerful enough to keep your water nice and hot throughout your entire massage. It’s easy to pour the water out once you’re done using it. This machine is rather large, so it’s hard to move it around when it’s filled with water. Thankfully, a removable plug allows you to empty it out with ease. Large size. The tub can accommodate large male feet, making it a good choice for couples. It’s easy to move it around. The wheels on the bottom work quite well. There’s no way to fine tune your foot massage. For example, you flip the water jets on and off. If you want to use the jets, you have to select a foot massage program that features jets and then wait for them to switch on. The FBD-1023 is one of the best all-in-one foot spas out there. It’s huge, but the wheels on the bottom and the removable plug are very handy. It has all the features and settings that you’d expect on a product like this: water jets, bubbles, calf massager, etc. The only downside is that there is no way to program your own foot massage. You are stuck with the factory settings. Fortunately, the built-in settings are quite good. Foot spa massage machines are awesome, but not everyone likes lugging a huge tub of water around the house. If convenience is your biggest priority, it’s better to go with a mini foot spa massager. One of the best features on this machine is its powerful heater. It’s strong enough to quickly warm up your water in just a matter of minutes. We also liked the fact that this machine’s price is quite nice. 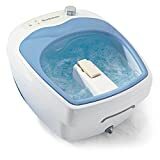 If you’re interested in a small yet powerful water powered foot massage machine that’ll wash and relax your feet, the FB-600 is right up your alley. It comes with several handy attachments. The included useful pedicure attachments make it easy to get to work on your toes, nails and feet. The powerful, speedy internal heater. The internal heater is quite powerful, allowing you to quickly heat up a fresh vat of water for your feet. Easy to use. This product’s small profile and light weight make it easy to take care of your feet. Low price. This spa style foot massager is much cheaper than most of the other massagers on this list. The bubble motor isn’t very strong. There’s no point in buying a foot massage gadget if you’re never going to use it. If the thought of emptying out a giant tub of water makes you feel lazy, the FB-600 may be just the type of massage machine you’ve been looking for. All the foot spa gadgets on our list come with strong heaters, but the Heated Foot Bath by Brookstone takes the cake. You can crank this machine all the way up to 115 degrees. A foot bath is a great way to stay warm in the wintertime. Also, hot foot baths are great for your health. A nice, hot foot bath can help relieve menstrual pain. Foot baths effectively reduce any type of swelling, pain or inflammation. Very powerful heater. Most foot baths require you to heat up the tub water a bit beforehand. But this machine eliminates the need to prep your water before you dump it in. Fully adjustable jets. Some foot bath machines don’t let you control the jets, but the dials on this one allows you to control every detail of your foot massage. Large size. This unisex foot bath machine is perfect for both men and women. It comes with a pumice stone. If you want to scrub the dead skin off your heels while you soak them in hot water, you can pop in the pumice stone. You’re not supposed to add oils or bath salts to the water. If you add them in anyway, you’ll nullify the warranty and damage the pumps. The best thing about this massager is its powerful heater. We also liked how the jet dials let you exert control over your foot massage. If you hate pre-programmed massage programs and love the feeling of hot water on your feet, you’ll like this machine. But if you routinely use oil and bath salts to wash and massage your feet, you’d be better off with a different product. On the bottom of your foot, there’s a thick tissue called the plantar fascia. If you’re overweight or do a lot of heavy lifting or running, your plantar fascia may start swelling up periodically. Most people with plantar fasciitis experience pain in the morning or after strenuous exercise. One way to to treat plantar fasciitis is to invest in a foot massage machine. The Moji Foot PRO was designed with plantar fasciitis sufferers in mind. Made specifically to help people suffering from plantar fasciitis. This is one of the few bathroom scales we’ve seen that can connect to the internet. It’s inexpensive, yet the materials are of good quality. Because it doesn’t have any moving parts or motors, this massager is cheaper than most of the products on our list. You can stick the removable steel balls in the freezer. The cold helps reduce the swollen parts of your feet. It only weighs one pound. This massager is very portable and will easily fit inside a briefcase. You can easily carry it to and from the office. The metal balls are supposed to rotate, but they sometimes get stuck in place. 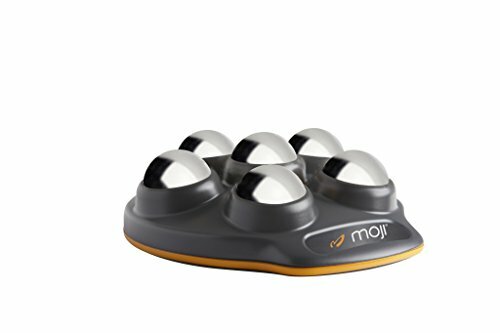 If you have plantar fasciitis and you’re sick of massaging your feet with tennis balls or frozen soda bottles, the Moji Foot PRO is an effective alternative. But if you’re looking for a full-featured foot massager device with internal heating and motorized massage programs, this therapeutic foot massager isn’t the answer.